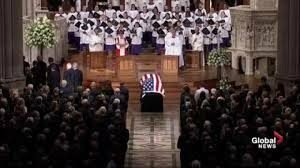 Of the reams of commentary and hours of digital documentation about the death and week-long, multimedia-transmitted funeral of U.S. Senator John McCain, who died of brain cancer last month at age 81, I thought the best-written — and most sensible – op-ed reflection was written by Rebecca Solnit, author of Men Explain Things to Me (2014) and more than a dozen other books. Appended to the image of a remembrance candle, I noted, with irony aforethought, that “on an internet platform devoted to the notion of Thumbs Up” – Facebook’s famous icon to indicate that you “like” something – “I’m remembering someone who, on the floor of the U.S. Senate, said Thumbs Down to an evil proposal that would have taken away health care insurance from millions of people.” I was referring to McCain’s decisive and dramatic vote (perhaps an overly dramatic imperial gesture) on July 27, 2017, to defeat his party’s and his president’s attempt to “repeal and replace” the health care reform law introduced by President Barack Obama in 2009. The Republican Party’s initial opposition to “Obamacare” became the party’s obsessive symbol of their unremitting resistance to (and even hatred of) Obama and their justification for total rejection of every significant Obama legislative proposal for the next eight years. Politically neutral government agencies estimated that the Republican “relacement” plan would deprive some 20 million, mostly impoverished people of health care coverage they presently had, thanks to Obamacare. My brief intendedly inoffensive note about McCain on FB was written in the genre of speak-no-evil of the very recently dead, and politely recall something good about them if you can. Once they’re fully dead and buried, you can thrash them all you want under the rubric of writing “history.” Yes, it’s true that McCain had initially voted against the so-called “Obamacare” reform, and he had done dozens of other things one could criticize, but that wasn’t the point at that moment of remembrance. The point was to recall something good. The genre of such praise is an old and perhaps fading tradition in western societies, but I tend to abide by it as a sensible courtesy to the grieving. 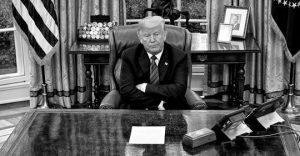 The need to denounce political opponents instanter upon their passing and to express self-righteous indignation about their lives strikes me as one of the myriad contemporary ways to make it “all about you” rather than about others – an art of self-absorption that the current American president has lifted to the highest gutters. The instant denunciation also tends to be condescending in that it seems to assume that if you don’t explain that the deceased was a spawn of the devil, that your auditors are so benighted (or just plain dumb) that in the wave of remorse and false sentimentality that attends death they will forget that the evil that men do lives on beyond them. No sooner had I posted my innocuous message about McCain than one of my FB “friends” felt compelled to inform me, with a harumph, “and that was pretty much his only redeeming vote.” Well, not so fast. What about the time, during the 2008 presidential campaign that pitted Obama versus McCain, when a McCain supporter at one of his rallies denounced Obama as an “Arab” (a “dog-whistle” term for a non-American-born foreigner, or maybe even a terrorist) and McCain instantly intervened to say, “No ma’am, he’s not an Arab,” and then went on to praise his opponent as a decent person devoted to family and country? Or what about the more recent occasion when McCain took to the Senate floor and called for “regular order,” a code-term reminding his colleagues of the violation of legislative norms and courtesy by the Trump administration? I could probably find several other such incidents, I mused aloud. I guess that these days we would describe the overall message as a meme, as such things are known. Those interested in matters of semiotics – the study of signs and symbols, and their interpretation – will know that a meme is “a unit of cultural information, as a concept, belief, or practice” that is intended to spread from person to person and become part of their perspective. “Meme” is short for “mimeme” (a combination of “mimesis” + “-eme”) and was coined by British biologist Richard Dawkins. In this instance, McCain’s meme was aimed at getting certain people to recognize the ideal of a bi-partisan, at least minimally civil, version of politics and to encourage them to reject the bombast, cruelty and ignorance that Trump’s “populism” has brought to American civic life. Further, the meme was primarily aimed at segments of McCain’s own Republican Party that had succumbed to the crude blandishments offered by Trumpism, as well as to a significant sector of so-called “independents” who don’t necessarily identify with either of the two major parties. That this was delivered with an eye to the forthcoming mid-term congressional elections in November could hardly be missed. Given that the outcome of those elections will likely be decided by a narrow sliver of the middle-of-the-road electorate, appealing to those voters from your deathbed is hardly a small thing. Yet, a surprisingly large number of observers seemed intent on ignoring McCain’s meme, which I thought to be as crucial to the overall event, if not more so, as the predictable, but heartfelt encomiums to the deceased from mainstream liberal and conservative commentators, and the equally predictable, if far less impactful denunciation from the further left end of the political spectrum. Naturally, there was bound to be evaluative commentary about McCain’s “legacy” (the more profound version exemplified by Rebecca Solnit’s discussion), and it was no doubt inevitable that denunciations of perfidy would be heard in the echo chambers of the left. What was interesting to me was how much McCain had insisted, in leaving the world, on its present condition. At the funeral itself, in Washington’s National Cathedral on Sat., Sept. 1, the meme was the undertow of the ceremony. 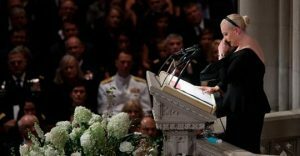 Meghan McCain, the senator’s daughter, told the 2,500 invited guests: “We gather to mourn the passing of American greatness, the real thing, not cheap rhetoric from men who’ll never come near the sacrifice he gave so willlingly, not the opportunistic appropriation of those who lived lives of comfort and privilege while he suffered and served.” Again, you could disagree with the claims of greatness, but you had no doubt whom she was referring to when she talked about “cheap rhetoric.” Earlier in the week, Trump had made matters embarrassingly worse when he refused to order the White House flag to be flown at half-mast or to issue the standard proclamations of respect, until public and professional disapproval forced him to back down. Her remarks were seconded by former presidents Obama and George W. Bush. 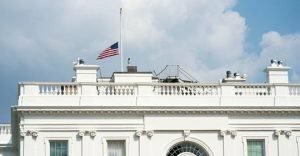 “So much of our politics, our public life, our public discourse,” said Obama, “can seem small and mean and petty, trafficking in bombast and insult and phony controversies and manufactured outrage.” Could anything be pettier than Trump’s behaviour about whether or not to lower a flag – this from a man who heckled and threatened football players for taking a knee during the performance of the national anthem to protest police violence against unarmed black men. 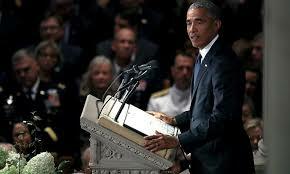 “It’s a politics that pretends to be brave and tough, but in fact is born of fear,” Obama said. George Bush reiterated such sentiments, during a day that the press described as one “full of coded repudiations of Trump’s nationalism and demagoguery.” Bush praised McCain as someone who “loved freedom with the passion of a man who knew its absence and, perhaps above all, detested the abuse of power and could not abide bigots and swaggering despots.” By then, the object of his description had retreated to one of his nearby golf courses for a tour of the greens. And just in case I missed the point, he appended a several-thousand word article from one of the more excited leftist publications reviewing McCain’s entire career, and finding every warmongering fault imaginable. I can’t remember if the article mentioned that after McCain’s five-years-plus captivity in Vietnam as a prisoner of war, he was welcomed to the country some 20 or more times as a visitor and politician, and as a senator campaigned successfully for the restoration of normal diplomatic relations between the U.S. and Vietnam. Maybe the article mentioned it and I missed it. Oh well, never mind. Of course, the reason I’m more interested in left-wing criticisms of McCain than in conservative praise is because I think I’m a leftist and that I share political ideas and convictions with these FB “friends” and the authors of the articles they post to make sure I’m not backsliding. What strikes me about much of this leftist commentary is how strangely tone-deaf it is. Even on the day of the death of a political opponent, such people have a hard time saying anything gracious about the deceased. Instead, they feel compelled to rub our noses in their version of the truth as if the rest of us are so stupid that we’ll fall into perdition if we aren’t reminded of that truth at every moment. I often wonder who such publications think they’re writing for, as if they don’t know that their limited readerships are already lefties who already know more than enough about alleged miscreants like McCain. Maybe they’re hoping to reach wavering liberals who have yet to be persuaded that McCain was something other than a fairly complex conservative, as Rebecca Solnit suggests. In the meantime, maybe McCain’s meme will make a small contribution to resolving, as Solnit puts it, “our problems with complex people and complex descriptions.” Or, failing that, will persuade some voters in the aproaching mid-term elections to repudiate the temper (and temper tantrums) of the times.